Erin has contributed a new recipe to the Julepstyle recipe database. It’s for some really yummy pizzas. And even though I’m writing this in the morning, I’m craving some of her Pizza! 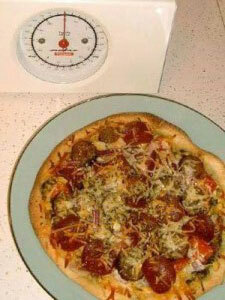 Cut the pizza dough in half, form into thin pizza crusts, 8-10” in diameter. Pre-bake according to package directions. Saute’ garlic and mushrooms in a teaspoon or so of olive oil until garlic is golden brown. Mix Alfredo sauce and pesto until well blended. In a bowl, mix all cheeses together. Spoon sauce onto pre-baked crusts. Add all vegetable toppings except for the onion, top all with cheese mixture leaving about a quarter of the cheese to use later. Place turkey sausage rounds, onion, and turkey pepperoni on top of cheese, sprinkle with remaining cheese mixture and seasoning. Bake for 10-15 minutes. Cut each into 4 pieces and serve!